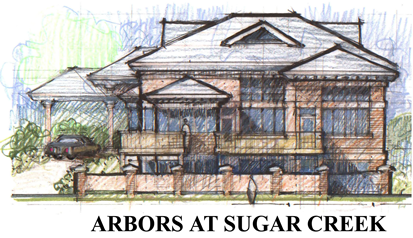 The Arbors at Sugar Creek is a 9-acre development of 15 high-end custom designed homes. 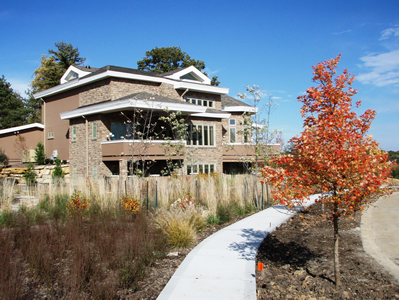 Architect Jim Holtzman and Construction Manager Jay Jarvis, owners of Evolution Developments, LLC, were approached by the landowner because of their reputation for conservation developments. The political climate dictated that this development have the look and feel of other developments in the area. Therefore, our objectives were to incorporate conservation site design principles with no variances to local regulations. In addition, the downstream neighbors to the south have an undersized stormwater system and suffered from erosion due to the overland flow coming off the existing site. Due to this situation we placed high standards on handling of stormwater for this new development. The result is a stormwater system with two detention basins that provide extended detention for smaller storms in an effort to more closely approximate the pre-developed hydrology. The two existing inlets south of the site that receive stormwater from the property saw an 18% and 80% reduction in overland flow. 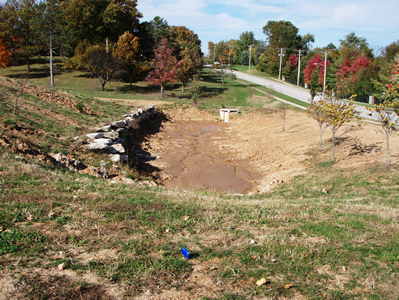 This stormwater has been routed to the detention basin with controlled release to the enclosed stormwater system. 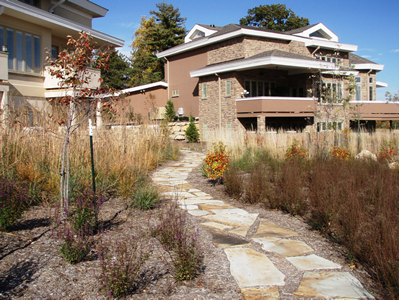 Other conservation aspects include short retaining walls to save trees and preserve native soil, an extensive tree replacement program, an aggressive erosion and sediment control plan, and a landscaping plan dominated by Missouri native vegetation.